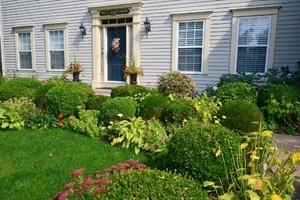 Eagle's Wing invites you to an elegant, friendly, quiet colonial style home. A short stroll to the Shaw theatre, fine dining, shopping, golfing and great trails. It is the Heart of wine country overlooking a beautiful landscaped garden. In addition, there is a fantastic audio gazebo to relax in. Comfortable guest lounge with TV & VCR, bar fridge, library, central air,and is smoke free. Fireplace for your comfort. Breath taking walk to beautiful old town. King and Queen size beds with ensuite bathrooms. Hardwood floors throughout. Enjoy a full gourmet breakfast in an elegant dining room, on the patio or in the audio gazebo thats overlooking the beautiful garden.Fresh baked muffin, croissants, and fruits in the morning. Enjoy a full gourmet breakfast. Fresh baked muffin, croissants, and fruits in the morning.